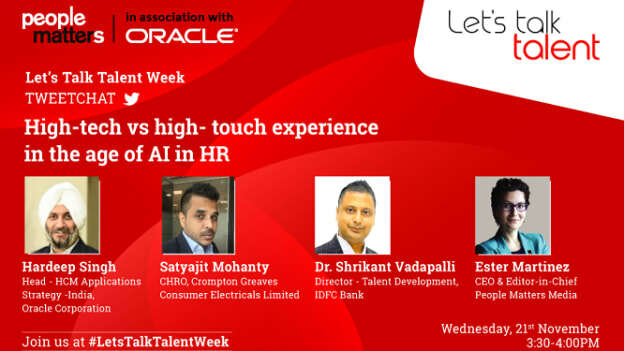 As a part of #LetsTalkTalentWeek, People matters in partnership with Oracle conducted a Tweetchat that brainstorm ideas on how HR professionals, as well as service providers, can navigate the shifting landscape of digitization in HR. Read on to find what the leaders thought about re-inventing HR in the digital age. With HR technology being leveraged at every stage of the employee lifecycle, how can talent professionals identify the key human and machine touchpoints? As bots take over transactional functions, which are functions that need a greater human connection? What are the challenges that HR leaders should be aware of? And how should the HR organization re-invent itself? It is this set of mysteries which the expert panel of guests including Hardeep Singh, Head - HCM Applications Strategy - India, Oracle Corporation; Ester Martinez, CEO & Editor-in-Chief, People Matters; Satyajit Mohanty, CHRO, Crompton Greaves Consumer Electricals Limited, and Dr. Shrikant Vadapalli, Director - Talent Development, IDFC Bank aimed to demystify in this Tweetchat giving their views on navigating the shifting landscape of digitization in HR. Q1. Why should HR leaders be thinking about “high touch vs high tech” experience? Q2. What are the biggest challenges companies face today with respect to the use of technology? Q3. How should HR navigate a loss of human touch? Q4. What according to you will be the biggest impact with bots taking up transactional functions? Q5. What is the one key takeaway that you would like to put to use viz a viz. tech use?